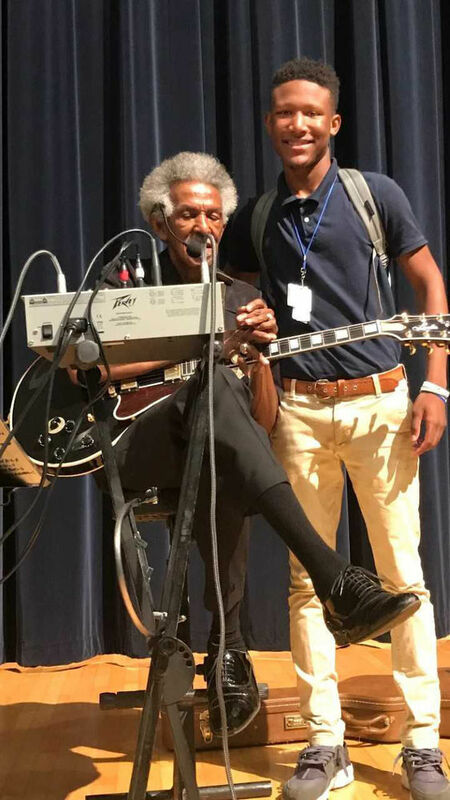 International blues star Lil' Jimmy Reed came back to West Feliciana to perform for the West Feliciana High band, at the St. Francisville Rotary Club, the Council on Aging and The Francis Restaurant on Sept. 25. Reed was born Leon Atkins in Hardwood and graduated from John Dawson High School. He moved to Baton Rouge as a teenager and joined the Army. After serving 20 years in the Army, he decided to retire and to continue his passion of playing the blues. He acquired the name Lil' Jimmy Reed after filling last minute for the original Jimmy Reed. "I have played all of the world, in every country except China and Japan," Reed said. Schools Superintendent Hollis Milton, a blues enthusiast, recognized that Reed was from Hardwood while looking at biographies of blues players in the lineup for the Baton Rouge Blues Jam. "I immediately knew that I had to contact this gentlemen and ask that he come perform for our students. This is his second visit back in the last two years, and it feels like a homecoming each time. Everyone is excited to see him and hear him play, and he enjoys coming home," Milton said.